Human Rights vs Islamic Beliefs. I thought universal human rights were mainly recognized. Surprise. I'm learning the truth about Islam. Human Rights vs Islamic Beliefs. I thought universal human rights were mainly recognized. I'm learning the truth about Islam. The equality of women and men. The equality of all races. The equality of people of all sexual orientations. The right to practice whatever religion one happens to believe in, or not to believe in any religion. I thought those rights were all but established. Or anyway, that we were well on our way to having them universally recognized. Sure, there were places like China, with lots of human rights violations. And there was backsliding into fundamentalist Islam in places like Iran with the Ayatollah Khomeini. But I didn't take those very seriously. At least the West and Europe were safe, or so I believed. Some things that I saw as universal human rights were, I was certain, solidly entrenched. I can't believe that any more. It flies in the face of the facts. It's like being physically healthy - but not taking care to stay that way, letting in things dangerous for your health. Stealth Islamization and open Islamization. It's such an amazing turn of events for me. And an important one to recognize. In fact, it makes everything else I've dealt with minor in comparison. There, I was on the clearly winning side. It was just a matter of time. Yes, I believe we'll win. But the other side is across a much wider gap. And winning is not such a foregone conclusion - especially with so many who are for human rights somehow blocked from seeing what is there, ever more clearly, in our midst, invited in because we could not imagine it could be dangerous. Human rights to all? But what if a growing presence is staunchly - in its fundaments - against these rights. PS. I put together a small flyer, an image of a consequence of Islamic beliefs - and below, several resources that give the content of Islamic religious texts and present far more of the consequences of that content. 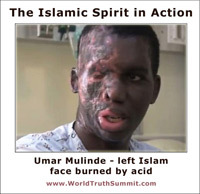 I'm learning the truth about Islam, facts about Islam.